Burn Stewart Distillers has unveiled the new Black Bottle Scotch Whisky – a return to the original blend and bottle design. Black Bottle is a premium blended Scotch Whisky which was launched in 1879 by Gordon Graham & Co and acquired by Burn Stewart in 2003. It is presently exported to over 30 countries globally, however, approximately 80% of sales are UK, but this is expected to change with its new bottle and new blend, both created to have greater appeal to a new generation of whisky drinkers and new world markets. Burn Stewart will launch Black Bottle in new packaging, abandoning the regular green glass whisky bottle and re-introducing the distinctive black glass bottle, which was the original inspiration behind the name of the brand. This iconic bottle was used by the Graham brothers up until the outbreak of the First World War when supplies from the German manufacturer ceased and they were forced to revert to a standard green glass bottle which has remained until the present day. The new tapered, embossed and debossed and tapered black glass bottle with metalic gold, black and white printed PS labels was designed by a Northamptonshire-based company, Robinson Associates Design, and the bottles manufactured by Allied Glass. 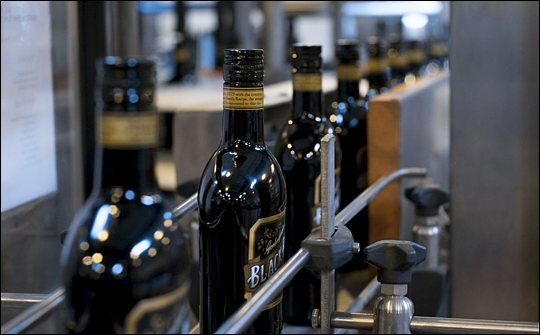 Black Bottle will be available internationally from October 2013 (40%ABV, UK RRP £17.99-£18.99).